Aesthetic dental prosthesis with dental prostheses, etc. Missing natural teeth, irrespective of whether they are individual teeth or a complete dentition, can be replaced with fixed or removable dental prosthetic solutions. In doing so the dental prosthesis is only one of the many possibilities available for replacing the natural teeth. Dental prosthetics cover the planning, manufacture and incorporation of the prosthesis, for which the dentist collaborates with a dental laboratory during the prosthetic work. Furthermore, some of our centres have the CEREC system, which enables the production of dental solutions on site in the dental practice. Bridges and crowns are permanent dental prostheses. This variation of dental prosthesis is closest to the original, natural dentition; and therefore is able to almost completely recreate the normal chewing and speaking functions, unlike removable dental prostheses. Thanks to the most state-of-the-art technologies it is possible to produce bridges and crowns from aesthetic ceramic material, which looks natural and is very long-lasting. Dental prostheses are removable false teeth. Here a distinction is made between a partial prosthesis and a complete prosthesis. 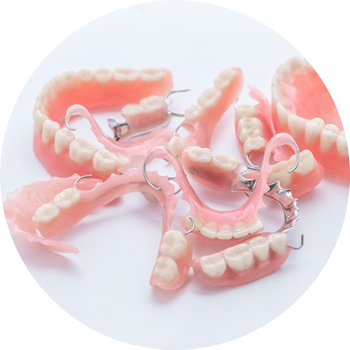 A partial prosthesis is used if there are still a sufficient number of teeth in the jaw. However, if this is no longer the case, then we must fall back on a complete prosthesis. The function of the dental prostheses can also be supported in some cases in by dental implants. We work exclusively with dental laboratories that are recognised for their exceptional quality and high reliability, as well as offering a guarantee of several years on their work. We work primarily with local Swiss laboratories. The advantage of Swiss laboratories is the faster processing of the dental prosthetic work as well as the good range of services. This includes for example, selecting the shape and colour of the dental prosthesis with us in the practice. Our dentists are happy to advise you when selecting the best laboratory for you.